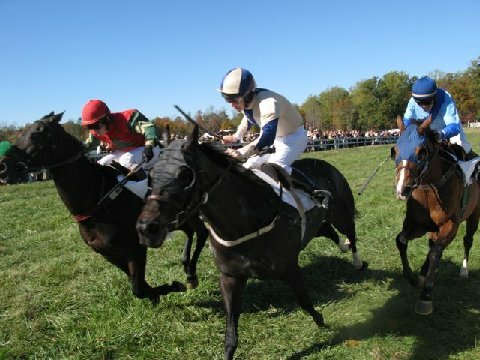 The Montpelier Hunt Races have been held on the front lawn of James Madison’s Montpelier since 1924. The gates opened this year at 9:30 Am. There was a good turn out of Madison Family Descendants for the races, and again this year! It was a beautiful fall day, and it began with the Jack Russell races which was fun to watch! Those family members that have joined the Madison Cabinet (the support group for the Montpelier Foundation) began their morning with a hunt breakfast under a large tent in front of the mansion. Many of the family members’s tail-gated, and brought virtual feasts with them. There were several Smithfield Hams and Virginia biscuits scattered among us. Some of our family member’s who attended this year included Gail Babnew, Peggy Macon Boeker, Frederick Madison Smith, The Honorable Helen Marie Taylor, Sally Madison Macon Dixon, John Macon, Harriet Garrett, William Garrett, Susan Garrett, Ridge and Delane Porter, Eleanor Porter, Susan Fogg and daughter, Sam and Pam Wornom, Billy Thornton, Ann Thornton, Lee Belfield Heath, Carol and Charles Alderman. It was a great weekend. The races were fun. There were parties in the county, and a number of us got to see farms (other than Montpelier) that once belonged to our ancestor’s. Dining in Gordonsville, Orange, Culpepper, and Keswick just keeps getting better and better each year. It is no wonder that Orange County has become arguably the most interesting county to visit in Virginia.